In the Dirt: Is The Moose Cooked? Coming off two disappointing starts against the Angels and Tigers, Mike Mussina had a lot to prove last night then proceeded to get stomped for six runs in three innings in Detroit. Even the Moose himself is changing his tune. "If Joe thinks that somebody else can give us a lift or do the job better, that's up to him," Mussina said in the Daily News. While the Yankees fight for their playoff hopes the obvious options don’t get you too excited. Ian Kennedy is probably the best choice, but Kennedy doesn’t even have a full season in the minor leagues under his belt. While the Yanks already have one of last year’s draft picks on their rotation it makes them even less likely to throw all their eggs in one basket. The most likely option is Matt DeSalvo who has already had a cup of coffee with the Yanks this season. Last night DeSalvo pitched 8 innings and only allowed a run with the Scranton Yankees. This season at triple-A he has an 8-5 record with a 2.82 ERA, but with the Bombers he a 6.18 ERA in 7 appearances. Another name being tossed around as a possible Moose replacement is Steven White. White is a 26-year old pitcher from Texas who started the season in double-A but has thrown the majority of his innings this year at the triple-A level in Scranton. He has an ERA of 3.61 and a 5-4 record. An option that is always on the table, however unlikely, is Kei Igawa. 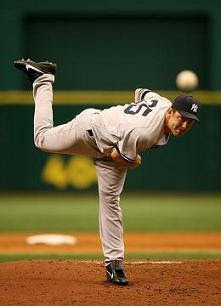 In 12 appearances with the Yanks this season Igawa has not impressed while having a 2-3 record and a 6.79 ERA. Overall this season in the minors he has a 5-5 record with a 3.45 ERA, but since his last demotion has gone 2-2 and a 4.21 ERA. While none of those options are very appealing Mussina is not making any improvements on the mound. His fastball sat at a meager 86-MPH and reached as low as 84-MPH. As for his next opponent, Tampa, he has a 7.59 ERA against them in 2 appearances already this season. For more NY sports covering all 9 local teams go to Hot Stove NY.